For state-of-the-art concrete raising that uses eco-friendly polyurethane foam to raise and lift your concrete in less time, with less holes and won't sink or settle again! We have the lowest minimum in Kansas City! We specialize in repairing your sunken concrete: driveway, sidewalk, steps, patio, porch, basement floor, garage floor and pool decks. No job is too small for us. Our minimums are substantially less! 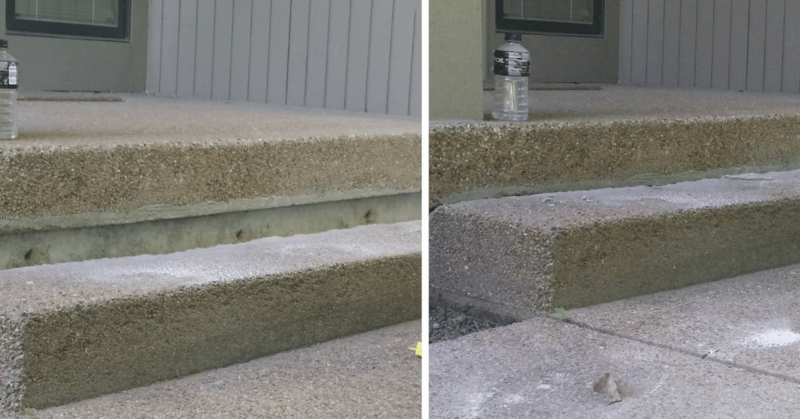 Concrete Raising Systems is a local Kansas City owned company in business to provide residential and commercial customers with a better alternative to concrete repair and traditional mud jacking. Concrete Raising Systems uses a state-of-the-art Polyurethane foam injection material as opposed to the traditional mud jacking processes which use dirt, water and cement mixture. Since 2012, Jason and Ken have owned Concrete Raising Systems. They are the experts doing the work. 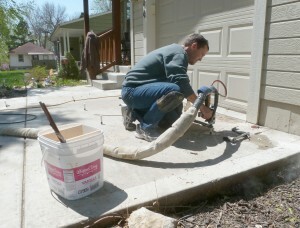 Pictured below is Jason, foam jacking a driveway! Small jobs are not a problem for us. We are a small business and we appreciate all sizes of jobs! Using Concrete Raising System is a cost-effective, eco-friendly alternative to traditional mud jacking. 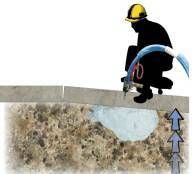 When you choose Foam Jacking, you won’t have to raise your concrete again! Concrete sinks as the soil underneath a slab, either compacts (the water in the ground has evaporated to the point that it has shrunken) or a void or pocket has been created due to erosion from running water (from a downspout or a natural sloping of the ground toward your cement) or rainwater, causing a concrete slab to sink, settle or become uneven. The weather in our Kansas City region has been fairly dry since 2008. When a region experiences less rain or moisture, the water in the soil evaporates which dries the soil causing the cement slabs to sink into the ground in an uneven way. Winter snow and ice or improper draining onto your driveway can be especially problematic for concrete. Make sure when the ground thaws each spring you check your driveway and sidewalks for gaps between the concrete slabs. If you think you may have an issue with sinking concrete, call us. The sooner you call us the more cost-effective our visit can be! Contact the Polyurethane foam mud jacking experts at Concrete Raising Systems today! All we do is concrete raising with foam in Kansas City! Traditional mud jacking also referred to as ‘slab jacking’, is a process of raising a section of concrete by drilling many holes approximately 2” wide (and up to 4” wide in some cases) in the concrete and pumping a mixture of clean fill dirt, water and cement through the holes effectively pushing the concrete up from below. Traditional mud jacking materials can weigh 100-120 lbs. per cubic foot. Once the cement is lifted, the holes are patched. Foam jacking is a two-part process where polyurethane foam is injected through holes in the concrete approximately that are 5/8” in diameter. The concrete is effectively raised with the expansion of the foam. The foam jacking material will expand in the weak soil first to consolidate and cause the dirt to become denser and fill all voids below the concrete. It expands in all directions, sometimes as much as 7 feet, so fewer holes are needed to raise the concrete. The foam is set in 30 minutes. Our foam jacking method will not retain moisture so it is not subject to erosion once it is set. Polyurethane foam jacking does not settle due to its lightweight nature. Foam weighs 3-8 pounds per cubic foot. The small holes are professionally patched. Look through our before and after photos to see more of our work. We guarantee our work for 2 years. If your sunken concrete is over 10 years old and we raise your sidewalk or driveway and within 2 years it drops more than 1/4” – we will raise it again for free! Thirty percent of our jobs in Kansas City is repairing the concrete where traditional mud jacking failed. Which means, you paid twice to have the job done right! We are good for the environment. Our polyurethane foam jacking product is made from recycled materials that were made in the U.S.! Have you been told you need to replace your concrete? Our concrete raising quotes are 50-70% less than the cost of replacing your driveway or sidewalk! Why replace your good concrete when you can raise your concrete with an eco-friendly product from a local Kansas City company? No reason we can think of! That’s all we do. We lift concrete in Kansas City. We specialize in foam concrete raising and repair for your driveway, sidewalk, patio, pool deck, and garage and basement floor. Weighs Less: Polyurethane foam weighs less per cubic foot than mud jacking. Won’t settle more! Less Cost. 50 – 70% less than concrete replacement costs. Less Invasive. We don’t tear up your lawn and you won’t need to reseed. No heavy equipment needed. Less Time: We get the job done in hours and not days or weeks! Foam jacking is less noisy and takes fewer people to accomplish (less labor costs). Waterproof: resists erosion! No more settling! Eco-Friendly: Our product is high-tech and U.S. made from recycled materials! You can call us anytime! We can use our high-tech foam jacking method to repair your concrete until the ground freezes and as soon as it thaws! On average, we can give you an estimate within 4-7 business days. We won’t stand you up and we don’t take a deposit. (You won’t believe the stories we’ve heard about unfinished work and lost money. Unbelievable!) We have an impeccable reputation and we plan on keeping it that way. Call (816) 419-8306 or contact us and request a bid from Concrete Raising Systems today! Concrete Repair. That’s all we do. 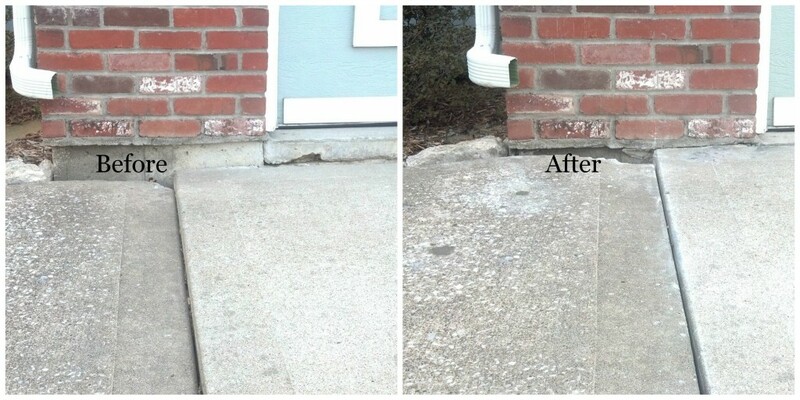 We lift uneven or sunken concrete slabs for driveways, sidewalks, steps, patios, porches or garages with foam jacking! We can fix your concrete in less than one week! fix it once with foam and be done! Call us at 816-419-8306 or email us to request an on-site quote. Our team will get your job done within a week!